A contemporary choice in the solid wood field, Pure Woods place acute care and attention on current trends and styles. Constantly evolving and developing both solid and engineered products, Pure Woods is an ideal choice for the modern home. The ultimate engineered wood flooring that still holds the aesthetic pleasure of solid wood. Chêne puts the greatest care and attention in to ensuring stability and resistance, making their products ideal to cater for the busy modern living space. The diverse Baüsen range from James Latham assures a good quality at competitive rates. With both solid and engineered products, the Baüsen range is always evolving and adding new styles and ideas, meaning that you can select the perfect setting for your unique home setting. A Lancashire business, Atkinson and Kirby are a well-known manufacturer of traditional hard-wood flooring. Their products combine the best of British craftsmanship whilst also pursuing a contemporary design, manufactured to the highest possible standards. Market leaders in the design and manufacture of luxury vinyl tile flooring, Amtico International is a company based in innovation and inspiration. Distributed across the globe, this brand is ideal for those wanting a unique and contemporary design with an inherently authentic feel. Moduleo Design Floors offer an extensive and diverse range of luxury vinyl tiles that fulfil the criteria of a natural-looking yet durable flooring solution. The environmental excellence and certified safety underfoot constitutes the great appeal of Moduleo floors. 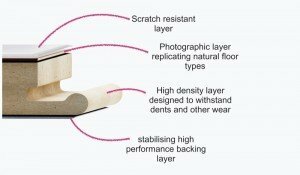 Polyflor is now an international supplier in vinyl flooring for both the professional and the domestic setting. The Manchester-based company are known for their excellent customer service and quality-driven mantra. The TLC flooring collection assimilates natural materials accurately whilst also providing a practical flooring solution to the home. This collection of vinyl tiles are ideal for the busy, hard-wearing, modern life and ensure durability. The vinyl range from Sanders & Fink is a popular one. With a classic look, these vinyl tiles are versatile and practical in the sense that they provide a space for your unique home decorations. Style and substance meet in the Distincitve vinyl tiles: with an elegent and smooth aesthetic value as well as being easy to clean and practical. A unique floor system yet also a solution that will last and last. An elaborate range of modern finishes with unique designs make the laminate range from Elka an ideal option for the contemporary setting. With high definition surface structures, the authentic appearance of the floor is assured across the range, as well as being a practical flooring solution. With a vast repertoire of colours and collections, Balterio holds the possbibility of a perfect laminate floor for your home. Whilst in-keeping with the practical nature of Laminate flooring, Balterio’s extensive range also assures a high quality that has been developed over years of research. Established in 1897 in Austria, Kaindl are recognized specialists in wood processing. Their laminate collection aims to recharacterise a room, with a variety of surface structures and large range of tones, Kaindl laminate floors promise a valuable addition to whatever atmosphere you wish to create. With a concise focus on creating authenticity, Kronoswiss have used innovative methods to create the look and feel of a real hardwood flooring in their laminate range. Promising durability, practicality and an attractive finish, Kronoswiss are a popular option for providing the backdrop for any room of the house. The laminate flooring collection by Kronotex promises both style and substance. German-engineered, Kronotex have established a firm reputation in the laminate circle, also credited for their infamous commitment to naturally sustainable raw materials. The laminate products from Chêne encourage the look and feel of real wood, this making the collection an ideal option for those who want a laminate floor that omits the warmth and atmosphere of a hardwood floor. With exceptional quality and a vast variety of styles, Chene is a popular choice for laminate flooring. With over 100 years of experience in the industry and a firmly established local and global reputation, the Brink & Campman brand stands for traditional craftsmanship and innovation. Producing high quality rugs since 1897, the company offers new ranges every year, created to suit modern trends in fashion, implementing constant improvements in the furniture and the interior design industry. Alternative Flooring’s mission is to be the creative leader in a sea of average and bland flooring products. Their quest is to bring innovation and high quality alternatives to traditional flooring, whilst also adding a creative touch to their collection of rugs, carpets, and runners. Here you will find elegant designs, sustainable materials, and a passion for manufacturing rugs and runners that will make any modern home stand out. With an impressive heritage, a keen eye for creative designs, and vast experience accumulated over the years, Louis de Poortere aim to be more than just a manufacturer of rugs, carpets and runners. Established in 1859, this Flemish company successfully takes the creativity of expert craftsmen, local carpet traditional techniques, and modern innovations, to bring new collections that inspire with their artistic designs and originality. For more than 40 years, Oriental Weavers have delivered high quality rugs and runners, offering amazing value, unique designs and durable products. One of the largest rug manufacturer in the world, the company maintains full supply chain autonomy and complete control over every manufacturing stage, from concept to the last finishing touches. Handmade, ethical, and intriguing. These words summarise Jacaranda’s rug collections, with products that have natural colours, sustainable materials, and always interesting textures. The company’s love for all things handmade is evident in all their products, as well as in their quest to produce innovative, interesting designs and environmentally friendly rugs without compromising quality. Based in Devon, Axminster are still a family run business, using traditional methods and expert craftsmanship to create the highest quality carpets and rugs. The company have been awarded the Royal Warrant, a seal of excellence and quality, recognised across the world. Axminster produce stunning rugs with detailed designs and bold colours, offering amazing durability for each of their products. A leading manufacturer of rugs, carpets and floor covering products, Nourison offer a vast range of excellent products for the modern home. From signature handmade rug ranges to luxury collections like Calvin Klein, the company provide practical flooring solutions and intriguing designs, to help you create a unique living space for you and your family. The Calvin Klein brand doesn’t need any introduction. This rug collection is ideal for a stylish, modern home. Exclusively made by Nourison Industries, Calvin Klein rugs are not only luxurious and designed with an eye for the latest trends, but they also feature exciting and original designs, wonderful textures and gorgeous colours. Opulence and quality in one package. Established in 2009, Bluebellgray has quickly transformed into one of the most creative home décor brands in Scotland and the UK. The Glasgow-based company anchors the designs in fine art, producing beautiful rugs, cushions, curtains, and more. Every rug is first hand-painted in the brand’s studio before it is transposed onto premium quality cotton and linen materials, using state-of-the-art technology. Established in 1861, Morris & Co was founded by William Morris, textile designer, writer, philosopher, and leading figure of the British Arts and Crafts Movement. Based on Morris’ own designs, these rug collections recreate the intricacy and beauty of the original patterns perfectly. Available in floral and traditional styles, the rugs blend traditional craftsmanship and classic charm with captivating patterns and premium quality wool. Founded in 1987 in Glasgow, Ted Baker transformed from a small clothing brand into a well-known lifestyle company with stores in the UK and the US as well as in Hong Kong, Singapore, Bangkok, and Dubai. This collection of Ted Baker Designer rugs features the same eye-catching and fresh designs that have made the brand so popular all over the world. Established in 1759, Wedgwood have been making luxurious and premium quality home accessories for more than 250 years. The Wedgwood Rugs collection continues the company’s quest to beautify living spaces, blending old and new in stunning designs that integrate into any décor. These rugs feature wool and silky viscose yarns, offering the perfect combination of resilience and elegance. From traditional floral or neo-classical patterns to stylish geometric designs, Wedgwood Eugs provide a convenient solution to create a refined décor in your home. Founded in 1966, Gradus have transformed from a small flooring accessories company, into well-known, leading manufacturer of top quality carpet tiles and broadloom, made using state-of-the-art technology. Guaranteeing durability, stain resistance and easier maintenance, alongside a comfortable feel and a luxurious look, Gradus are the perfect choice for both homes and the commercial environment. With a passion for sustainability, Interface hope to completely redesign the global flooring industry and to inspire other companies to follow their lead. Since 1973, the brand has been pursuing a vision of providing high quality products that don’t pollute the environment. The parent company of another successful brand, Heuga, Interface offer ethical, sustainable products, and beautiful designs to improve the look of properties across the world. Part of Interface, the giant flooring company, Heuga have built their own unique style, keeping the same passion for cleaner manufacturing processes and a love for the environment that drives them to always search for solutions to make their products better. Better for the world, better for customers. Here you’ll find bold colours, high quality, and versatile carpet tiles for any type of property. National Carpets use the best quality materials and offer competitive prices for all their collections. This certainly contributes to their increasing popularity in the UK and across Europe. Established for over 30 years, the company manufacture a wide range of carpet tile products for both the domestic and the commercial market.